About $3.4 million worth of social housing maintenance projects in Whyalla will be accelerated to stimulate employment. The projects will increase employment opportunities for skilled and unskilled labour over the next 16 months, with the employment opportunities open only to Whyalla residents. The new employment opportunities will be welcomed by Whyalla residents, who have been dealing recently with employment challenges in the region. The accelerated work program will also provide training opportunities and apprenticeships. The works will be funded by the State Government through Housing SA, and will be completed by 30 June 2018. Any Whyalla residents interested in these employment opportunities should contact Trade Maintenance Direct on (08) 86230400. In addition to the positive employment outcomes, the project will also improve the overall quality and condition of social housing in Whyalla. In total, about 220 properties will benefit from this work across all types of housing, including some group sites. 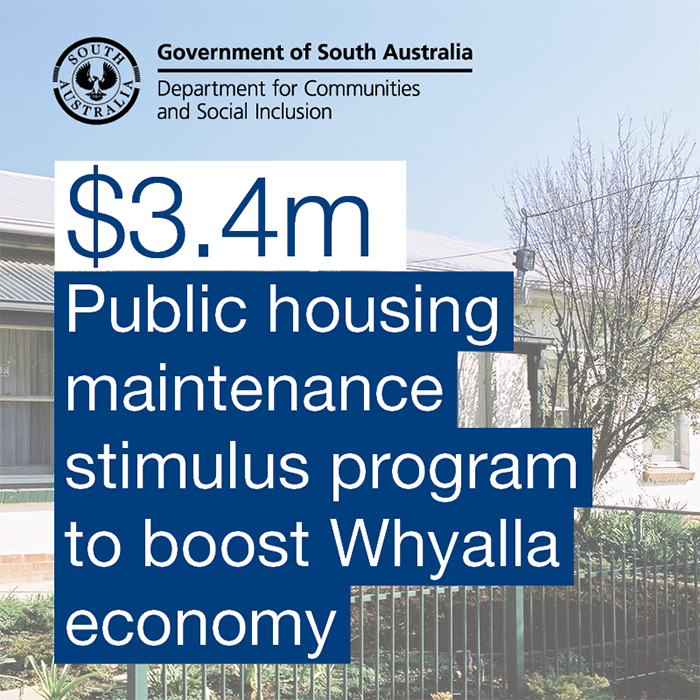 The stimulus project is in addition to upgrades already scheduled for Whyalla properties. Maintenance to social housing in other regions of the state will not be impacted by this project.